William Carlyle sat comfortably, his cane to his side and his dog resting under a cafe table, while he sipped a cup of coffee at Mojo's Village Bean in Cambria on a chilly morning in November. Carlyle, 76, put the coffee down, carefully opened a briefcase in his lap, and pulled out a photo album. Front and center on the cover page was a rectangular space for a title photo. It was left empty. HOME William Carlyle, 76, stands in front of a trailer on his vacant lot in Cambria. He lost his home in the Santa Margarita Hill Fire last June, and he now faces penalties from SLO County for code violations. "I put a blank," Carlyle said with pain in his voice, "because I don't want to think about it." Flipping through the contents explained why. Scattered across the pages were dozens of photos of his charred home and belongings, from vehicles to furniture, with the hazy, soot-speckled backdrop of rural Santa Margarita. Carlyle was one of four landowners whose residences were destroyed by the Hill Fire on June 26, 2017. Starting on Parkhill Road, 2 miles north of Santa Margarita, the Hill Fire ripped through Carlyle's 240-acre property—and 1,600 acres in total. "Everything got fried," the 40-year SLO County resident said. "It looks like a junkyard now. ... Mentally, I have trouble stepping on that 240 acres." Carlyle, who's physically handicapped, remembers just barely escaping the flames that day. "I saw the fire on the ridge, grabbed the dog, and jumped in my truck," he said. "If it had been five minutes later, I wouldn't be talking to you." In the immediate aftermath, Carlyle spent a month with some folks in Paso Robles who "took pity" on him, he said. But that came to an end, and now, nearly five months after losing his home, Carlyle is getting pushed to the brink of homelessness and, possibly, into court. 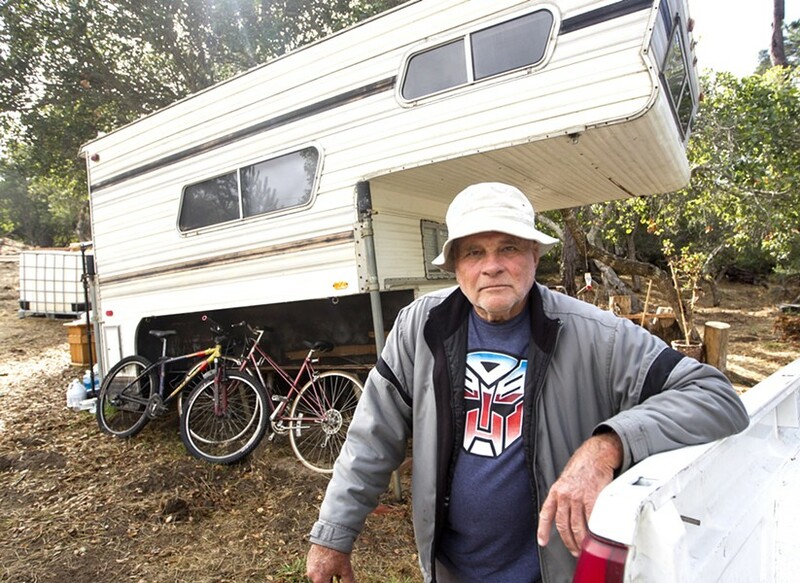 Following the stint in Paso, Carlyle brought his truck, trailer, dog, and remaining belongings to two undeveloped residential lots on Marjorie Place in Cambria that he purchased decades ago ("I saw an ad in the paper and had some extra coins," he said). Carlyle set up his trailer on one of them, and he's lived in it since late July, lugging in water and other resources when needed. "Right now, I'm just trying to survive," Carlyle said. But Carlyle's presence has raised red flags in the Cambria neighborhood. Four neighbors have called in to SLO County to complain about him, according to county Senior Code Enforcement Officer Marie Cullinane. Carlyle expressed sympathy for the neighbors' concerns and some disgust at himself for the situation, but he doesn't feel like he has much of a choice. His properties are impossible to legally live on or develop due to Cambria's water shortage and building moratorium. While he said he's trying to sell the lots and his 240 acres in Santa Margarita, he doesn't think they have much value or demand on the market. "The neighbors do not like me because I got this stupid camper that looks like a piece of junk on the edge of the road," Carlyle said. "And I don't blame them. I feel the same way. ... But I got no choice." Communication between Carlyle and the county has not yielded a solution. According to Cullinane, she arranged for Carlyle to move to an RV park in Cambria, but he declined it. "I have been working with Mr. Carlyle for several months in an attempt to resolve the situation," Cullinane wrote to New Times in an email. "Mr. Carlyle has indicated that he does not intend to move from that location." In October, the county issued a Notice of Violation to Carlyle for violating ordinances that prohibit living in an RV in a residential zone and storing materials on undeveloped land. Officials also cited health and safety concerns related to human waste disposal and fire hazards. Carlyle faces fines of up to $500 per day and/or a public nuisance lawsuit if he doesn't vacate the land by Nov. 17, according to the Notice of Violation. Carlyle said he feels he should have some property rights and has contacted the Board of Supervisors for help. "The word flexibility, the county doesn't know what that word means," Carlyle said. "I agree that the county has to control things. But to have no flexibility when something like this happens ... they are absolutely tunnel vision: 'Just get out.'" According to SLO County 2nd District Supervisor Bruce Gibson, the county does not offer residents who are victims of fires direct financial or property relief, unless a fire reaches a level where the Federal Emergency Management Agency (FEMA) offers assistance, which the Hill Fire did not. "It is a difficult situation," Supervisor Gibson told New Times. "It's just the reality of our ordinances that you can't set up camp on a vacant property in the middle of a residential neighborhood." Carlyle is ready to argue his case in court or before the Board of Supervisors, if necessary. "If it goes that way, it goes that way," he said. Despite the predicament, Carlyle considers himself lucky to be alive. He fought back tears while talking about the suffering of those who died in the Northern California fires in October. He feels he can make a new life for himself on his own.